I'm still confused about this game, however the journey from start to finish in this addictively entertaining title is definitely worth the admission price on iTunes alone, even with the confusion. 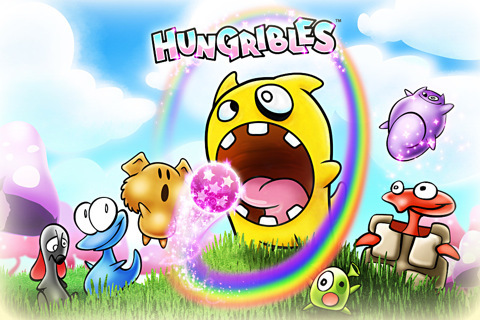 Hungribles are basically little creatures with massive appetites and the role of the player is to ensure that these creatures are fed. But this is easier said than done and as you progress through each level, there are a variety of challenges blocking your way. 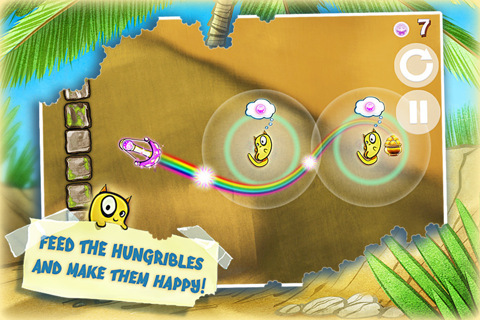 The game does contain a small tutorial when things change in the game such introducing new obstacles or creatures that must be fed or used to ensure that the other Hungribles are fed. These are down through pictures as opposed to pages and pages of text. In terms of feeding these critters, you basically have a magical umbrella and by pushing your finger back on it, it arms the Umbrella like a crossbow and by letting go, it shoots a purple ball for your Hungrible. Yummy! Once all your Hungribles are fed, you then proceed to the next level. Unfortunately there are obstacles in the way such as stone blocks that sometimes prevent you from firing directly at the Hungrible. This is where the strategy comes into play as you bounce these purple bubbles of food off walls and into the mouths of hungry Hungribles. Another interesting tactic is that some Hungribles have their own gravity circles around that can be used to slingshot a ball around them or even bounce balls off them. Some Hungribles are then used to reverse these gravity circles and to make matters worse, you are limited to the number of shots you have. 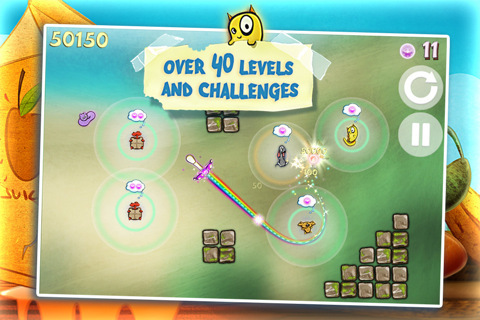 With three worlds available in this current release and a planned "new" world coming soon, Hungribles is a relaxing albeit frustrating game that can be played again and again. Add in bonus levels, scores and an attempt to get three gold stars on every level and this title has some great longevity going for it. Given these facts, I haven't had this much on an iPhone game for quite some time and Futuremark Game Studios should be commended for creating a brilliant casual game. 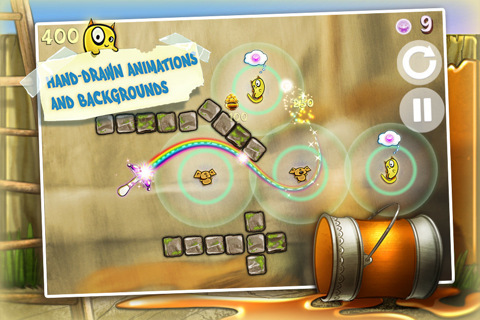 With great cartoon graphics that look like something out of a Pokemon game (plus awesome hand painted backgrounds) and a very cute sounding musical score plus some fun sound effects, Hungribles comes together well in all facets of this amazingly entertaining game. The only issue I did have with the game that at times, my magical umbrella didn't want to work but this was more because I wasn't using it as a crossbow as opposed to the game itself. Final Thoughts? 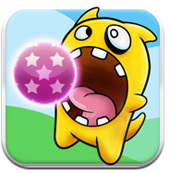 Go out and bring Hungribles home to your iPhone, iPod or iPad!